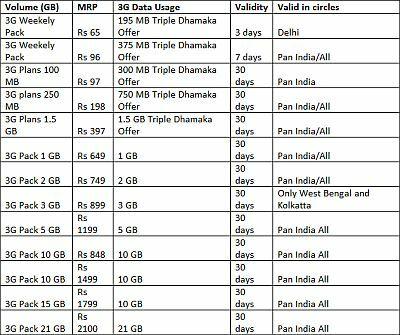 Telecom service provider Reliance Communications is offering a special scheme for its 3G subscribers by offering triple data download for the cost of a single plan, according to various media outlets. The offer allows Reliance 3G customers to download three times more than the existing download limit without any extra charges. The users can buy the 3G weekly pack worth Rs. 65 and avail of data usage up to 195 MB with a validity of three days. The offer is available in 333 towns of the 13 3G circles of the company and customers can subscribe to it through R World, retail outlets, or by SMS. Ealier last week, state run 3G operator BSNL with the largest pan India presence (it is present in all the 3G circles barring Mumbai and New Delhi) announced a hike in its tariff plans. The hike in tariffs was apparently due to increasing operating costs and debt accumulation due to the acquiring of 3G and broadband wireless access (BWA) spectrum. Reliance recently launched cheapest 3G enabled tablet model priced at Rs 12,999 and runs on the Android 2.3 (Gingerbread) operating system. The tablet comes with number of pre-loaded applications like R World Online, You Tube, Google Map & Google Search and Gmail among others. Other features of the device include GPS, MobileTV and Voice calling. Reliance Communications' consolidated net profit fell 37.4 per cent, from Rs 250.89 crore in Q1 FY11 to Rs 157 crore for the quarter ended June, 2011. The telco has reported 10.79 per cent fall in standalone revenue, from Rs 3,178 crore to Rs 2,835 crore on an annual basis, for the quarter ended June, 2011. Net loss has also reduced 44.6 per cent to Rs 272 crore, from Rs 491 crore.